Safety Clamps can be used time after time without failure. Inferior clamps are known to rust and seize, costing you the consumer, huge losses in replacement costs. Several other types of clamps take minutes and tools to install. We provide the worlds best Safety Clamps that take only seconds to install. On larger, big diameter water corrals or portable storage tanks, that equals hours of labor savings every time a tank is set. Plus tool time to lay out and pick up tools, and that’s if the other clamps work when the get to the site. Take the gamble out of your clamping system and stop throwing money away. Order the Worlds Best Safety Clamps today. For a tank setup that would take 200 clamps with a 4 man crew @ $25.00 per hour, 1 tank per day, 5 days a week, 52 weeks per year. 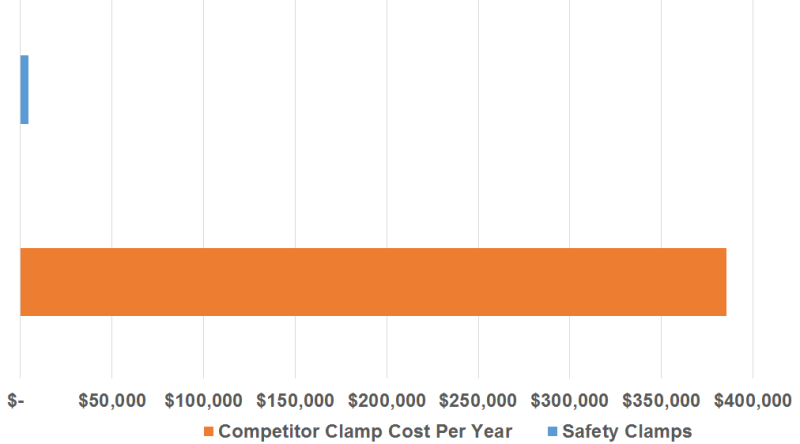 The cost of the clamps with our clamps is $4,334.20 per year for the tank vs $86,580.00 from our competitors. *Costs are figured on 200 clamps per tank set up, four men per crew at $25 per hour, per man, one tank per day, 5 days a week, and 52 weeks per year. Our competitors have an average time of one minute to set up a clamp. This is a low estimate, some clamps take up to three minutes to set up. Allowing for 200 clamps per tank setup this equals 200 minutes or 3.33 hours per man per tank. Next average a salary at $25 per man and a four man crew this equals $100 per hour. 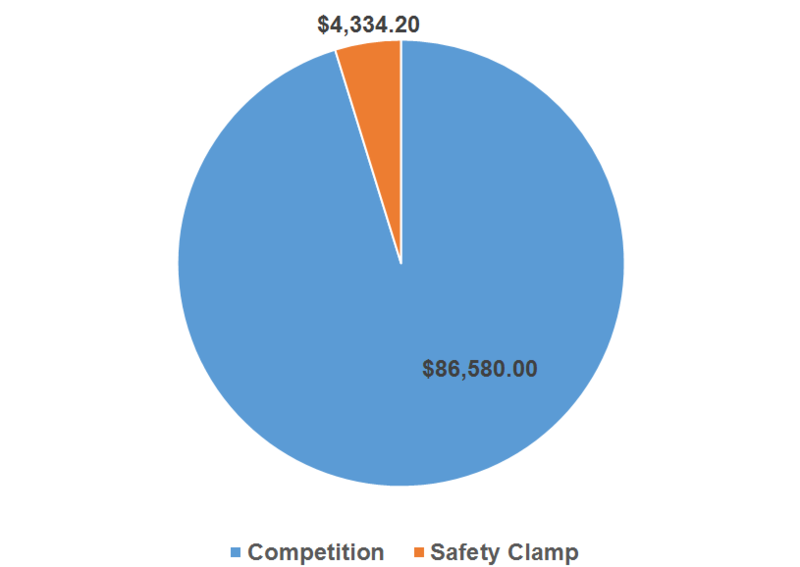 Then figure the $333 for clamping time and take that by 5 days per week and 52 weeks a year = $ 86,580 in labor for one crew just in clamp time. This figure is for one tank setup per day. Safety Clamp average set up is 3 seconds. That’s 20 Safety Clamps per minute. This means 200 Safety Clamps can be placed in 10 minutes. Thus our time equals 10 minutes labor for the clamping time per man. With a 4 man crew at this rate, each getting $25 per hour, this means an average of $16.67 per each clamp time. This is less than 1 hour paid out for the whole crew. Now using the same figures as above, this means our Safety Clamp will only cost your company $4,334.20 dollars per year for one crew to set up one tank per day, 5 days a week, 52 weeks a year. This number is low. The reason being is competitors clamps require tools for set up. On the above figure no time was factored in to set up tools, pick up tools and police the ground for tools that are laying around. That is at least 1 hour per day spent at 100 dollars times 5 per week is 500 dollars by 52 weeks a year, that’s another $26,000 savings. Safety Clamps do not require any tools for set up and thus saves this money every year. Keep in mind there will be added time for picking through the piles for usable clamps from the competitors, ones that are not frozen by rust. (Screw style clamps rust up). This will add at least 1 hour per tank with four people on site. At 1 tank per day, 5 per week that’s 20 hours’ time paid out 52 weeks per year = 1,040 wasted man hours at $25 per hour= $26,000 per year wasted. Also there is time on site to put penetrating oil on the old clamps, from the competitors to make them move along with the mess to clean up. As well as extra time to pack more clamps due to the failure factor and time to load up and haul off the broken and defective ones. This will add at least half an hour to the day by 4 guys at $25 per hour = 2 hours paid out per day, or $50 per day. Take that times 5 days by 52 weeks per year = $13,000 per year. Now let’s figure the extra time for rental of a telehandler or crane. At an average or $200 per hour by 4.5 hours extra per day of added expenses, simply by using the wrong clamps. This is $900 per day times 5 days per week is $4,500 by 52 weeks per year= $234,000 of loss, per year. Now the savings really show up! When it’s time to move the tank and reset it, Safety Clamps still come off in a couple seconds. The competitions rusted and frozen clamps, have to be beaten or broken off the tank. 3 to 5 minutes for every stuck one and if that tank has been used for long term storage, most of them will be tough to get off. Plus now as a company you have the extra cost of reordering replacement clamps, the old style rusted clamps are disposable with dependability issues. Safety Clamps are reusable and dependable. 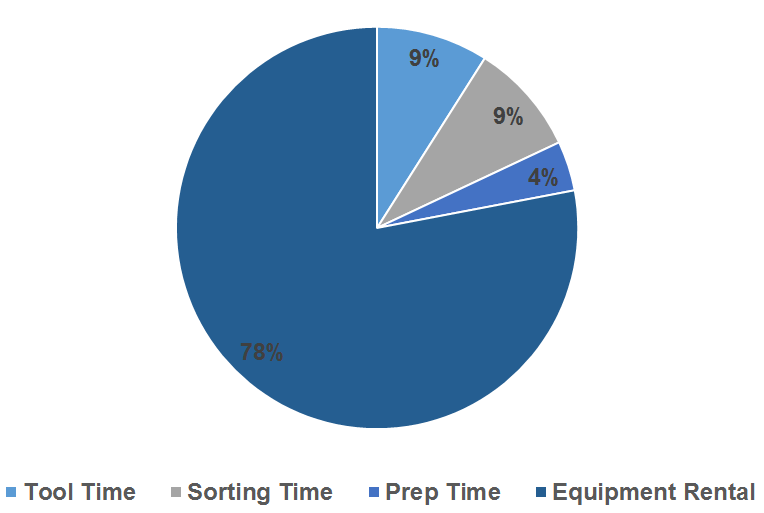 This works out to be a large number of lost time and replacement costs. You can see by these figures that our clamps will pay for themselves, it’s just like getting free clamps!